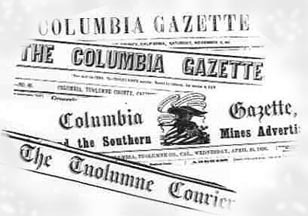 The Columbia Gazette which was first issued in the fall of 1852 was Columbia's most important newspaper. 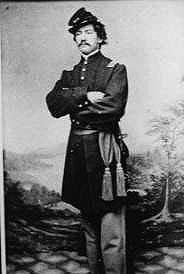 Colonel Thomas A. Falconer, an experienced newspaperman from Holly Springs, Mississippi, set the policy followed by the best of Columbia's papers: non-partisanship, truth and stern avoidance of anything derogatory or of a personal nature. In June of 1852, Falconer was mining in the Bensonville area, south of St. Ann's church on Kennebec Hill, with a few friends. By September he began the process of establishing a newspaper in Columbia. Friends provided a loan and he purchased the press and materials from the Sonora Mountain Whig. (The Whig had ceased publication in August after four issues) He had a rough start after the bad experience which had befallen the Columbia Star. Falconer soon smooth over their fears and on October 4, 1852 he moved the press from Sonora to a building on the east side of Main Street, two doors south of Washington Street. 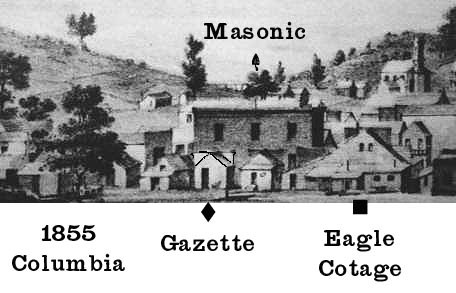 The first issue of the gazette was printed 19 days later! By the second issue he stated, We are gratified to have the office "literally crowded with our citizens all calling to give us their names as subscribers to our paper." A watchmaker opened his business in the front office of the Gazette. Falconer had a long cold winter and managed to bring the paper along working alone. By March 5th, 1853 he announced he was moving the office. The new office was on the south side of Washington Street in a frame building on the site of the present Eagle Cotage (actually records and an 1855 etching show it standing where the Ice Cream Parlour of today stands). Three businesses ran in this building with the Gazette in the western end; A book store, office space and print shop. Besides others, Falconer also hired John C. Duchow on June 26, 1853. November 5th, 1853, Falconer announced he would sell the business to Duchow and Yancy. Falconer returned to Mississippi! 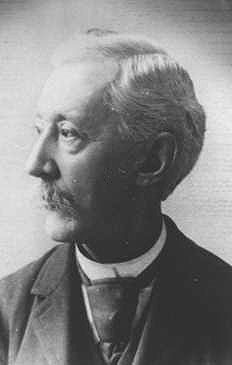 John Charles Duchow was born in Salem Massachusetts on October 14, 1830. After serving as an apprentise in a Salem newspaper he sailed from Boston April 30, 1852 to reach California August 13th. In San Francisco he worked on the Daily Alta and soon headed for Columbia where he joined up with an old classmate, Edward Boden. They were soon working for Falconer on the Gazette and eventually bought him out. A year later Colonel Thomas A Falconer, a printer from Mississppi, talked the town into letting him print the Columbia Gazette which was in circulation from Oct. 23 1852 to Nov 10, 1855. John Charles Duchow and Tyron M. Yancey, a printer from Mississppi, took over as editors in Nov. of 1853. Then Robert J. Steele, a printer from Mississippi, August 19, 1854 to October 15 1855(?) or to the end, (By then it was merged with the Southern Mines Advertizer). Clipper & Gazette. / Clipper & Gazette Extra. The editors of the Gazette and the Clipper combined their efforts to create together the 3 issues (July 11, 15, 22 1854 following the fire of the 10th). Columbia Gazette & Southern Mines Advertizer. Then the Columbia Gazette & Southern Mines Advertizer came about from 1855 to 1857 under editors Duchow and Steel, (November 1855 to July 1856 Thomas Nugent Cazneau, a printer from New York. J.W. Oliver 2 months in 1858 and G.R. Parburt) with a special issue for politics with the Campaign Gazetteer September to November 1856. But between June 1856 to May 1857 there was the Weekly Columbian by J. Wing Oliver & William Wilson, a printer from Missouri (In that one year they had 1000 subscribers). By June 11, 1857 there was the Tuolumne Courier first under William A. Duchow and Major John B. Urmy, then with brother John Duchow a native of Salem, Mass. (who also purchased the Toulumne Independant in Sonora) and E. Boden, a printer from New York, to March 1, 1860. which lasted until 1866 in Columbia. The Duchow's continued the paper in Sonora for 30+ years longer. Soon the Courier had to compete with Columbia Weekly News from August 1858 to 1859 under Dan Youcham with H.C. Bennet as editor in 1859 and Samuel J. Noble at the end. Then the Columbia Times from 1860 to 1861 with H.C. Bennet.  A Repulican paper. They had "heated battles" with the differing politics of the Union Democrat of Sonora who were pro slavery, anti-Union and anti-Lincoln. Then finally in 1866 William G. Dinsmore published the Columbia Citizen which ended in 1867 as did any further newspapers from the little town. The Palmer & Rey Press. The History of the Building. History of Columbia's Newspapers 2.
created for the visitors to the Columbia State Historic park. © Columbia State Historic Park & Floyd D. P. Øydegaard.